In Minogue v Victoria (2018) 92 ALJR 668, ;  HCA 27, the High Court upheld legislation that made it virtually impossible for a specific prisoner to obtain parole. The Charter of Human Rights and Responsibilities 2006 (Vic) was expressly excluded from this legislation but Gageler J drew attention to the requirements of the Victorian Charter. His Honour suggested that legislation which removes the possibility of parole from specific prisoners and condemns them to a “life without hope” is contrary to the Victorian Charter. This article questions that suggestion. It argues that European and British law, which greatly inform the Victorian Charter, have accepted that a life sentence without the possibility of parole may be compatible with human rights law. The article argues that the same can be true in Victorian law in limited circumstances. In Miller (2016), the High Court emphatically affirmed the continued place of extended joint criminal enterprise (EJCE) as a discrete doctrine of complicity in the common law of Australia. This affirmation constitutes a clear movement away from the common law of the United Kingdom, which abolished the doctrine in Jogee (2016). The High Court’s decision to maintain the doctrine involves an attendant responsibility to clarify its content to achieve stability, consistency and to avoid injustice. In particular, there is a need to clarify exactly what the prosecution must prove in cases based on EJCE when it comes to the actus reus elements of the additional crime. Where the actus reus includes a consequence element, the Crown should be required to prove that the accused foresaw the possibility that all elements of the actus reus would occur (along with foresight of the possibility of the requisite mens rea). This means that for an offence of murder to be foreseen as a possibility, the secondary offender would need to have foreseen that the victim would die. Such a clarification is consistent with the High Court’s reasons for retaining the EJCE doctrine. 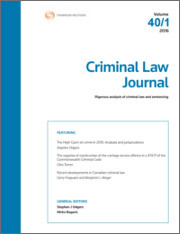 For the PDF version of the table of contents, click here: Crim LJ Vol 42 No 6 Contents.